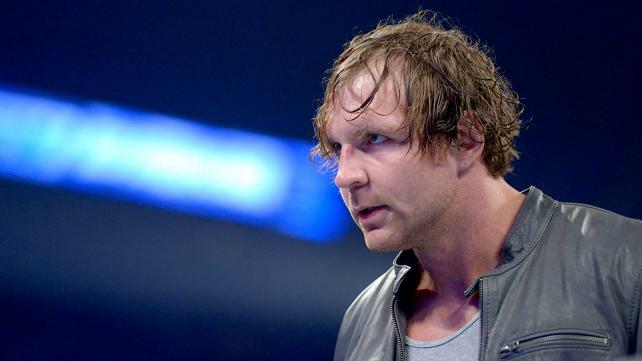 WWE: ‘Night of Champions’: Dean Ambrose ‘The Lunatic Fringe’!! On a night that was supposed to be all about WWE’s championships, and on a night where he wasn’t even scheduled to appear, the takeaway from Night of Champions is that Dean Ambrose is the coolest. 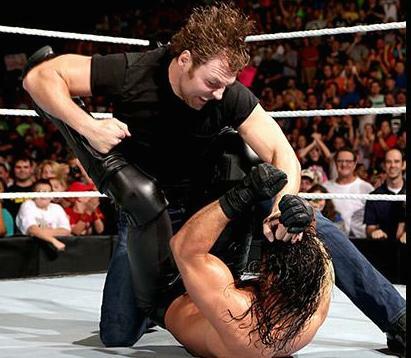 Ambrose had been off for a month after Seth Rollins and Corporate Kane took him out on an episode of Monday Night Raw. Rollins was scheduled to face Roman Reigns on Sunday, but Reigns underwent emergency surgery over the weekend and will be out for several months. While Rollins was gloating in the ring after demanding that the ref declare him the winner via forfeit, Ambrose arrived (via taxi cab; what timing!) and attacked Rollins. Since Rollins turned on the Shield in June, Ambrose has been a) 100% committed to destroying Seth Rollins, and b) an absolute lunatic. In those four short months he’s also become the most interesting character in the WWE. Unlike anyone else currently in WWE, Ambrose tests the boundaries of the relationship between the performers and the audience. He somehow manages to stay entirely within the confines of his character and the show while his character behaves entirely outside the boundaries of professional wrestling. Ambrose has avoided any kind of “worked shoot” promo that attempts to bring the audience into a stylized version of what’s “actually” happening backstage, and he recognizes Triple H and Stephanie as authority figures only in their on-screen roles as The Authority and not in some wink-wink nod to smark wrestling fans. While I feel obligated to mention that yes, I know that wrestling is scripted (you jerk), it is refreshing to see a strong character like Ambrose refrain from giving occasional “hey, I’m playing a character” nudges to the audience. But that doesn’t mean that Ambrose is just an old-school wrasslin’ character. He doesn’t wear wrestling gear; he shows up to every event in a graying tank top and jeans (feel free to call him “Jeans Ambrose“, there’s a whole corner of the internet ready to welcome you). He can’t be bothered to pose or talk about the WWE Network. And if he sees an opportunity to hurt Seth Rollins, he takes it without regard to the confines of scheduled matches or his own safety. 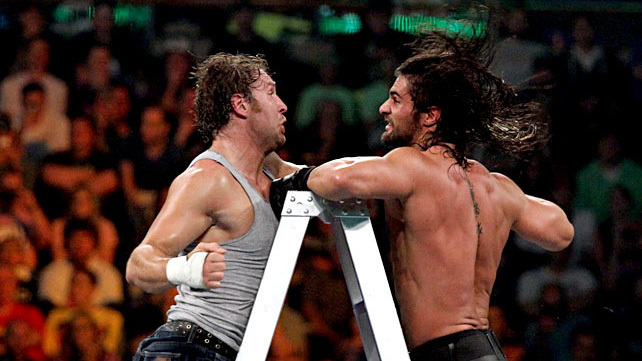 There have been three Dean Ambrose–Seth Rollins matches scheduled on WWE programming. The first got canceled because Ambrose decided that he’d rather beat the hell out of Rollins before the match even started, so he chased him around the arena alternatively beating the hell out of him and fighting off multiple security guards. The second was a lumberjack match to keep Rollins from running away (Ambrose got to choose the stipulation); Rollins eventually won after Ambrose exhausted himself alternatively beating the hell out of Rollins and fighting off all of the lumberjacks. The third was a falls count anywhere match that ended after Rollins and Corporate Kane teamed up to stomp Ambrose’s head into a pile of cinder blocks that happened to be in a box at ringside (yeah, it was weird). It seems like we’re headed towards Ambrose v. Rollins inside of Hell in a Cell next month, and if that’s the case I should probably start putting courtesy notes on my neighbors’ doors apologizing for any outbursts on October 26. Oh, and Ambrose might also be part of the Magician’s Alliance. A few weeks ago, he appeared out of the trunk of a car to beat up Rollins. Last night, he somehow escaped the room he was barricaded into and emerged from under the box that was supposed to be holding cinder blocks again. Look, if Ambrose never makes it to the top but does turn out to be the evolutionary GOB Bluth, I’m not going to be mad. It probably won’t happen, but keep an eye on it. While it’s an exciting time to be on the bandwagon of THE LUNATIC FRINGE, there could be some trouble brewing for Ambrose. He interacted with John Cena last night, in what felt to me like Cena’s attempt to have lunch with the cool kids. If this escalates into a full-blown rivalry, it has the potential to be amazing (CM Punk 2011) or depressing (Bray Wyatt 2014). If last night is any indication, Ambrose will more than hold his own, but for now just enjoy this clip of Dean Ambrose subverting the Ice Bucket Challenge and hope for the best. WWE Raw 5/11/15 Recap!! Daddy is Home!!! WWE: Raw 4/20/15 Recap!! Extreme Rules go Home Show! WWE: RAW 3/2/15 Recap!! No Moments of Zen! WWE: RAW 2/9/15 Recap!! Can’t We All Just Get Along? This entry was posted on Tuesday, September 23rd, 2014 at 2:26 pm	and is filed under Events, News, Television. You can follow any responses to this entry through the RSS 2.0 feed. You can skip to the end and leave a response. Pinging is currently not allowed. « HBO’s ‘True Detective 2’ Will Star Colin Farrell and Vince Vaughn!! [telling Will what to do] Open the chest with the key, and stab the heart. No-no-no-no. Don't stab the heart. The Dutchman needs a living heart, or there'll be no captain. And if there's no captain, there's no one to have the key.